This is a standard with choosing the right template for your site. 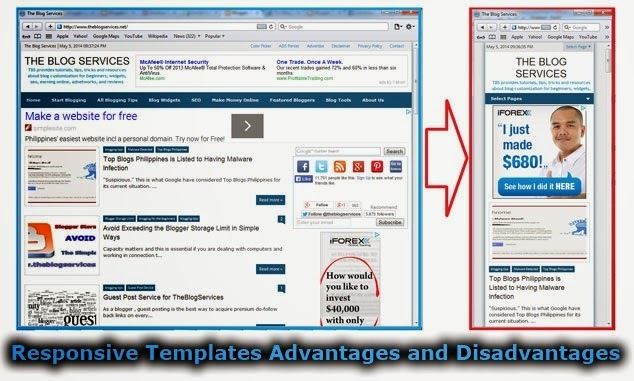 The thing is a template has an effect on the overall view of your site. You will see that the more organized your site is, the more at ease you are looking at it. And of course, if it is pleasing to your eyes, this might also be the case in the eyes of others. On this article I will be discussing about Responsive Templates Advantages and Disadvantages. In choosing the right template for your site, you have to conduct an investigation first of what template to use. Once you have already chosen one, the next thing that you will do is to study the positive and negative side, pros and cons, advantages and disadvantages and the like. This is in order for you to know exactly if the template that you are going to make use of is to your benefit or not. And this time we are going to talk about responsive templates. You have to bear in mind that you are spending money for a template and a site that is why you should get what your money is worth. Consistency in loading. The problem sometimes with a certain website is the inability to load faster because and download files faster. With responsive templates, it is easier for the page to load faster and allow downloading of data the quickest. Easy to manage. Another advantage of a responsive theme is that it is easy to manage. Whatever will be the brand that you will be able to place in your site, with the use of responsive themes, it can be managed easily and the presentation will seem look orderly for the visitor to utilize. Consistent branding. With consistent branding, you will be able to maximize the potential of your marketing strategy. You will strategize well with the use of responsive templates because every details will come together in relevance. Maintenance is low. You will not find it hard to maintain your site with use of responsive themes. It takes time to develop. If you are going to use a responsive template, it will take time for you to finish constructing and developing this theme. This is because of the things that you are going to set that are a bit complicated than normal themes. Support is very little. When using responsive templates, there are applications put on the theme that will not work on other computers or browsers due to the fact that it was customized a lot. Complex navigation menus. This happens because of the decreasing in the size of the screen that will make it hard for the user to access well to its navigation menus. Well, I have considered these things and that means to say that I have known the pros and cons of using responsive themes. I have decided to modify the template of my Theblogservices.net and made it responsive. Well, the result would be under observation.